Rose Valley is a rural residential area consisting of everything from one-story ramblers, manufactured homes, 2-story farmhouses, and large estates for sale, all on medium to large acreage. The Rose Valley area is located off I-5 and the Old Pacific Highway near Rose Valley Road. It belongs to the Kelso School District and is home to Rose Valley Elementary School. Residents are able to drive into downtown Kelso in about 15 minutes and Vancouver in about 40 minutes. 3 Beds | 2.25 Baths | 1500 sq. Ft.
3 Beds | 2 Baths | 2448 sq. Ft.
3 Beds | 2.75 Baths | 1920 sq. Ft.
4 Beds | 5 Baths | 5585 sq. Ft.
Blue Summit Realty has the most accurate and up to date Rose Valley real estate listings on the web. Currently there are 6 homes for sale, and 22 vacant land properties in Rose Valley. Of the 28 total Rose Valley residential listings for sale 0 are bank owned, 0 are short sales, 0 are new construction, and 0 are townhomes. The price ranges from $364,900 to $0 with a median list price of $584,217 and median sold price of $319,780. 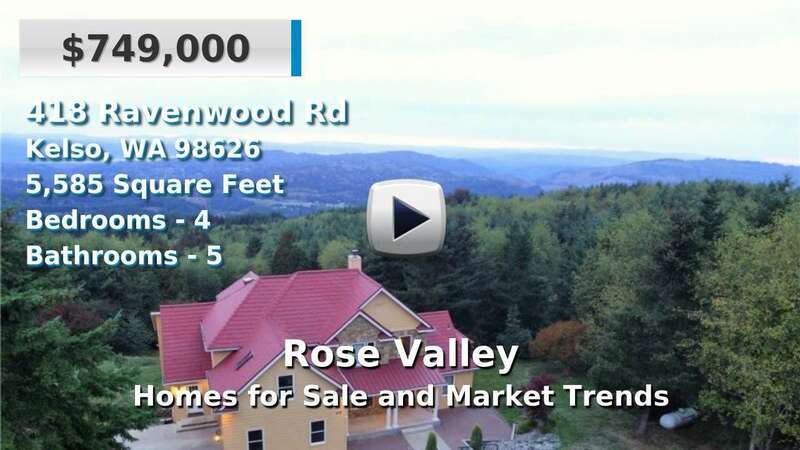 Make sure to refine your Rose Valley real estate search by property type, price, square footage, bedrooms, bathrooms and more with the search tool above or view the Rose Valley listings on our interactive map. Our Rose Valley real estate listings were updated 2 minutes ago.